(Slender Speedwell (Veronica filiformis) - 02) Slender speedwell is a low, creeping wildflower with 1/2 inch diameter flowers. 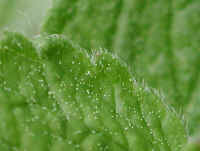 The stems and undersides of the alternating leaves are hairy. The leaves begin as oval shaped, but mature more roundish with rounded teeth on the edges. (Slender Speedwell (Veronica filiformis) - 01) This enlarged photo of the slender speedwell leaf shows the hairy and rounded toothed edges. The light yellow dots are pollen grains. (Slender Speedwell (Veronica filiformis) - 01a) This is a closer view of the slender speedwell flower. 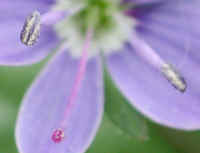 The actual size is only 1/2 inch across, which makes the flower in this full size photo about 22 times larger than normal. 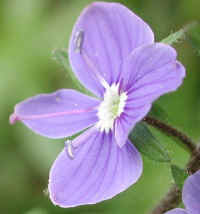 Each flower has two stamens and one pistil with a knob-like stigma. (Slender Speedwell (Veronica filiformis) - 01b) This is a partial edge view of the slender speedwell flower, looking down from the upper side. 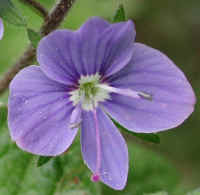 The flower has four petals, the bottom one being narrower than the three upper petals. 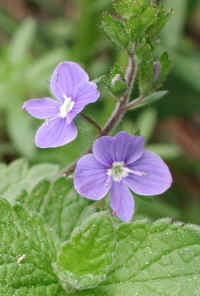 The slender speedwell is a member of the snapdragon family. (Slender Speedwell (Veronica filiformis) - 03) In this approximately 30 times enlargement, we focused on the knob-like stigma (lower-left) and the two anthers, the upper left one being the better one to view. 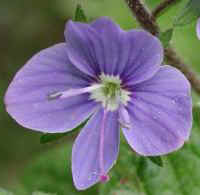 The name "speedwell" was derived from a legend concerning its healing powers. The legend relates a story about Jesus Christ's journey to Calvary, and how a young maiden (later canonized as St. Veronica) wiped His face with the flowers. As a result, healing properties were transferred to the flower. This is also how the scientific name was derived.